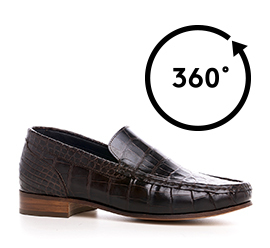 Luxurious elevator loafer made of fine dark brown Hermès crocodile leather and natural leather channel stitched sole that will add 2.6 inches (6.5 cm) to your height ensuring maximum durability and extreme comfort. An exclusive accessory entirely handmade by our master craftsmen and meticolously detailed which embodies the elegance and refinement Made in Italy, ideal to give a distinctive touch to your look. The GuidoMaggi master craftsmen allow to customize your handmade shoe according to any specific request.